Rose T. Thill, 92, of N Benjamin Street, Port Washington went to rest peacefully with the Lord on Sunday, September 24, 2006 at Sara Chudnow Senior Campus in Mequon, Wisconsin. She was born October 7, 1913 in Lake Church, Town of Belgium, Wisconsin to Frank and Catherine Schneider. She worked at Allen Edmonds Shoe Factory and Smith Brothers Restaurant prior to her marriage to Clarence Thill of Holy Cross Wisconsin on June 14, 1941. In 1959 they moved to Port Washington. Clarence preceded her in death October 16, 1995. 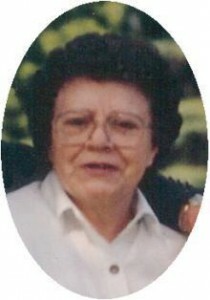 Rose was a member of St. Mary’s Catholic Church in Port Washington and the Christian Women for many years. She enjoyed taking care of everyone and love spending time with and cooking for her great grandchildren. She had a great sense of humor and lived life to the fullest, enjoying walks at Harrington Beach after her 80th birthday. We will all miss our mother, grandmother and great grandmother. She was the kind of person we all want to emulate and will always love and remember. She will be greatly missed, but we are sure there was a great reunion when she reunited with our father in Heaven. She is survived by her children Allan (JoAnn) Thill of Port Washington, Neil (Judy) Thill of Fredonia, Diane (Mark) Miller of Ashland, Wisconsin and Christa Ellenson of Port Washington. Further survived by 12 grandchildren, 25 great grandchildren, nieces, nephews, other relatives and friends. Preceded by her husband Clarence, 2 brothers and 9 sisters. The Rev. Allan Sommer will celebrate Mass 7:30 pm Friday, September 29, 2006 at St. Mary’s Catholic Church Port Washington. Entombment parish cemetery. Visitation 4 – 7 pm Friday at the funeral home with a 4 pm rosary service.